Other critics complain that media ecology scholars like McLuhan, Havelock, and Ong put forth a “Great Divide” theory, exaggerating the difference between orality and literacy, for example. And it is true that they see a great divide between orality and literacy. And a great divide between word and image. And a great divide between the alphabet, on the one hand, and pictographic and ideographic writing, on the other. And a great divide between clay tablets as a medium for writing and papyrus. And a great divide between parchment and paper. And a great divide between scribal copying and the printing press. And a great divide between typography and the electronic media. And now a great divide between virtuality and reality. I could continue to add to this list, but the point is that there are many divides, which suggests that no single one of them is all that great after all. The critics miss the point that media ecology scholars often work dialectically, using contrasts to understand media. His point, of course, is that those who use the “Great Divide” theory as a critique of orality-literacy studies and media ecology do miss the point: that the misunderstanding (error) isn’t within orality-literacy studies and media ecology but with those who get hung up on the idea of contrasting two mediums to better understand their natures. I rant from time-to-time about the use of secondary (or tertiary) orality to written forms of online communication because they represent misunderstandings of Walter Ong’s scholarship. This is not to say that there aren’t oral-like qualities to written online discourse any more than there are oral-like qualities to many kinds of written discourse. (See, for instance, Ong’s use of the term “residual orality.) At its basic level, the error is in trying to define written discourse as oral. While Ong’s “residual orality” works as a term because it refers directly to the carry over of oral features within written texts, he is (mostly) referring to features within written texts that are different from the oral features people find within online written texts. Rooting his questions in social use and practice, the answers to each is so clearly no, and that is the point. Just because two things have similarities does not mean that they have equivalency let alone that they are one and the same. And that, again, is before we set aside the fundamental issue that orality is rooted in acoustic space, that it is oral/aural, and that literacy is rooted in visual space, that it is visual and tactile. And just as important as the issues of medium and sensory perception is the issue of social use and practice. Fundamental to orality-literacy studies and media ecology is the notion that communication technologies exist within social frameworks. They help shape, and their uses are shaped by, the cultures in which they exist. Sparkle Pony helping me with some research. Last month I spent a week in Saint Louis to do some research in the Walter J. Ong, SJ, Manuscript Collection. It was my first research visit since I finished my three years as the initial processing archivist of the Ong Collection and left Saint Louis for a visiting position at UNC-Wilmington back in 2007. Far too long, really. I went back with some specific plans, including the creation of two digital exhibits based upon materials in the collection and getting permission to write an introduction to and seek publication for the one article which Father Ong had fully prepared for publication but never placed. All in all, it was a great trip, and, as Lisa predicted, just what I needed at this stage of reclaiming my scholarly voice. Going through my notebook I took with me on the trip, I found the following snippet, and I have no idea why I wrote it down other than that I found it amusing. In a Sept. 18, 1978 letter to Brian Vickers regarding the cost of possibly holding the International Society for the History of Rhetoric conference in the Netherlands, Fr. Ong wrote: “Maybe we could hire ourselves out to turn windmills or plug up the dikes.” [call no. : DOC MSS 64.2.1.1.199] As I said, I have no idea why made note of this. 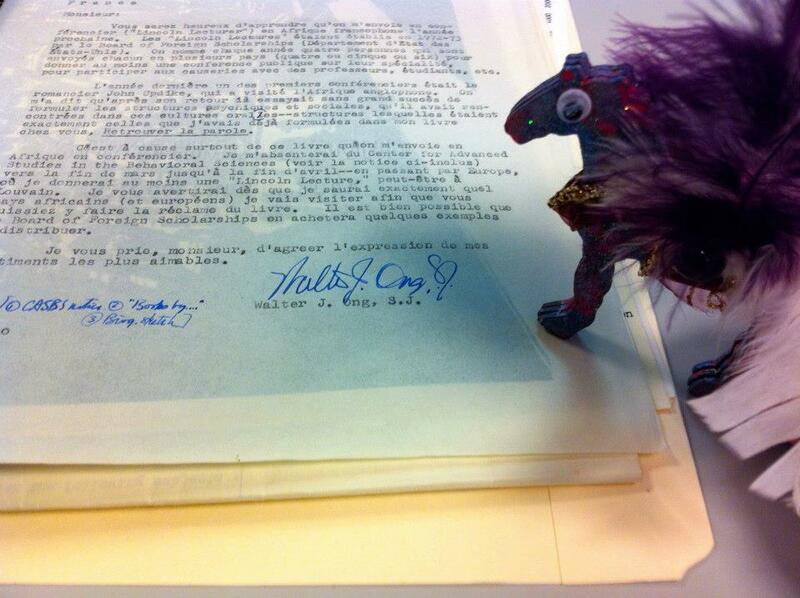 Note on the picture: That’s Sparkle Pony with a letter from the Lincoln Lecture files [call no. DOC MSS 2.1.1.237-39], which covers a month-long lecture tour Fr. Ong took through Western Africa (Cameroon, Nigeria, Senegal, and Zaire) in 1977 on behalf of the U.S. State Department as a Board of Foreign Scholars Lincoln Lecturer. Sparkle Pony is featured in Sierra & Stedman’s Kairos article “Ode to Sparklepony: Gamification in Action” (in particular, see “Part 2: The Game“) and inspired the Sparkle Pony Adventurer Soceity. Sparkle Pony wants you to know that while it is the Sparkle Pony, it is not the only sparklepony. Yes, Sparkle Pony often travels with me. As respondent, my role was to “provide brief a perspective on the work of Walter Ong especially as Ong’s work pertains to the issues covered by the above speakers. The respondent will also address the above speakers’ different interpretations of Ong’s work and connect their interpretations to the larger concern of Ong’s continued relevance to composition and rhetoric studies.” Presented here is a longer version of my prepared comments. It ends abruptly so that I could end the talk by addressing the individual papers and their relationship to Ong’s work. Speech is essentially a spoken and heard phenomenon, a matter of voice and ear, an event in the world of sound. Words are sounds. Written words are substitutes for sound and are only marks on a surface until they are converted to sound again, either in the imagination or by actual vocalization. And that, I think, is a central question raised by these presentations today: What do we make of all this? When we talk about words, are we talking about spoken words, written words, printed words, or all of them simultaneously? On the surface this question may seem simple. After all, oral communication is auditory and written and printed communication is visual. But, if it were that simple, why was I struggling with these questions. And why were so many others? And why, in fact, did Fr. Ong himself reply, “I don’t know what to make of it either”? Peter Elbow, in the beginning of first chapter of his newest book, Vernacular Eloquence: What Speech Can Bring to Writing, discusses specifically the difficulties in disentangling speech from writing and then spends the chapter trying to do so. In summarizing, he notes that while the differences between speech and writing are clear when we consider them as physical processes, as physical media, and as sensory modalities, the distinction is not so clear when we think about them as language or as products (19). The distinction between speech and writing as language and speech and writing as products become slippery, he notes, “because it depends so much upon social and cultural forces rather than the physical realm” (19). And that’s a key issue to remember here: when we talk about issues of orality and literacy, we are sometimes talking about physical processes, sometimes talking about physical media, sometimes talking about sensory modalities, sometimes talking about language, sometimes talking about products, and sometimes talking about many or all of them simultaneously. As Peter Elbow explains, “much of the confusion about speaking and writing [or, I would add, orality and literacy] comes from not noticing how these words operate in multiple realms or dimensions” (13). When working with these terms, we need to be precise, both for ourselves and for others. With that said, I want to make a few comments to help us better understand Fr. Ong’s work in orality-literacy contrasts, better understand how that work has been and continues to be relevant to the study composition and rhetoric, and how better to understand the presentations in this session. First, it might be of use to define what we mean when we talk about orality and literacy within the context of Fr. Ong’s work. In a 1996 interview in Composition Forum, Fr. Ong defines orality-literacy contrasts as “the understanding of the relationships between verbal as well as other types of human expression and the total evolution of the cosmos that we human beings are part of and are still learning more and more about daily” (Kleine and Gale, 83). Fr. Ong described what he did as associative, as trying to describe how various elements of human communication interrelate with consciousness, with culture, with technology, and with the cosmos at large. Understood in this light, the boundaries between the study orality-literacy contrasts and the study of composition and rhetoric are difficult to discern. It happened while I was doing my dissertation research in France […]. I was reading Rudoph Bultmann, the Protestant theologian, who made reference to the idea that knowing, for the Hebrews, had to do with hearing and sound, while the Greeks thought of knowing as related to seeing. I guess it took me about a day, but suddenly I could see how the whole thing fit together (404). Issues of orality and literacy aren’t just issues about spoken and written words but of how we organize and perceive the world in terms of acoustic and visual space. Both rhetoric and poetics, Ong explains in his unfinished manuscript Language as Hermeneutic: A Primer on the Word and Digitization, has its origins in the Greek word mythos and the Indo-European root meduh, which “signifies to reflect, think over, consider – activities interior to the human being” (1-2). Logic and dialectic, on the other hand, he explains, have their origins in the Greek logos, which has connotations of “computation, reckoning, account of money handled, hence treatment of cognitive matters in terms of discrete units—which are the basis of digitization” and the Indo-European root leg-, which is based upon “a spatialized, exteriorized visual and/or tactile metaphor” (2). For a more detailed discussion of Ong’s exploration of the sensorium and the aural/oral-visual roots in Ong’s exploration of orality and literacy, see The Presence of the Word, “‘I See What You Say’: Sense Analogues for Intellect,” and, to a lesser extent, Ramus, Method and the Decay of Dialogue. Another point I would like to make is that all too often when we discuss the oral-to-visual shift Ong describes in his work, we simplify it to just three stages: orality, literacy, and secondary orality. What this oversimplification leaves out is Ong’s concepts of primary orality (and its distinction from oralism), textuality, residual orality, digitization, secondary literacy and secondary visualism. Furthermore, this oversimplification gives the impression of a simple linear progression of technological development which Ong never intended, a point he makes explicit in the “Complications and Overlappings” section of chapter 2 of The Presence of the Word. In other words, Ong gave us a number of terms and concepts that far too few of us make use of. This crucial qualification is almost always left out of discussions of this chapter, most notably in Beth Daniell’s “Against the Great Leap Theory of Literacy.” When working with Ong’s terminology and concepts, we need to regard Ong’s work as a framework to extend, to develop, to push forward, and to push against. While Fr. Ong told me he wasn’t sure what to make of all this, the fact of the matter is that he had put much thought into it, and he had presented his ideas, both in an interview with Kleine and Gale, published in Composition Forum in 1996, and in some public lectures. To wrap up my comments, I want to end with a brief discussion of how Ong defined secondary orality, secondary literacy, and secondary visualism. While Ong mentions secondary literacy in the Composition Forum interview, his brief treatment of secondary visualism exists only in unpublished lectures found in the Walter J. Ong Manuscript Collection. The most detailed discussion is from a lecture given to students in Saint Louis University’s Aquinas Institute of Theology on 6 October 1995. About secondary visualism, Fr. Ong says: “Secondary orality is now accompanied by secondary visualism: computerized texts, graphics, etc. Ultimately, ‘virtual reality’” (“Secondary Orality and Secondary Visualism” 3). Daniell, Beth. “Against the Great Leap Theory of Literacy.” PRE/TEXT 7 (Fall-Winter 1986): 181-93. Elbow, Peter. Vernacular Eloquence: What Speech Can Bring to Writing. Oxford: Oxford UP, 2012. Kleine, Michael and Frederic Gale. “The Elusive Presence of the Word: An Interview with Walter Ong.” Composition Forum 7.2 (1996): 65-86. Nielson, Mark. “A Bridge Builder: Walter J. Ong at 80.” America 167.16 (Nov. 21, 1992): 404-406. Ong, Walter J. “Before Textuality: Orality and Interpretation.” Oral Tradition 3.3 (1988): 259-69; Rpt. in Faith and Contexts. Vol. 3: Further Essays, 1952-1990. Ed. Thomas J. Farrell and Paul A. Soukup. Atlanta: Scholars Press, 1995. 215-25. —. “Comment: Voice, Print, and Culture.” The Journal of Typographic Research 4.1 (1970): 77-83. —. “Digitization Ancient and Modern: Beginnings of Writing and Today’s Computers.” Communication Research Trends 18.2 (1998): 4-21. Rpt. in An Ong Reader: Challenges for Further Inquiry. Ed. Thomas J. Farrell and Paul A. Soukup. Cresskill, NJ: Hampton Press, 2002. 527-49. —. “Hermeneutic Forever: Voice, Text, Digitization, and the ‘I.’” Oral Tradition 10.1 (1995): 3-36. Rpt. in Faith and Contexts. Vol. 4: Additional Studies and Essays 1947-1996. Ed. Thomas J. Farrell and Paul A. Soukup. Atlanta: Scholars Press, 1999. 183-203. —. “‘I See What You Say’: Sense Analogues for Intellect.” Human Inquiries: Review of Existential Psychology and Psychiatry 10.1-3 (1970): 22-42. Rpt. in Interfaces of the Word: Studies in the Evolution of Consciousness. Ithaca: Cornell UP, 1977. 122-44. Rpt. in Faith and Contexts. Vol. 3: Further Essays, 1952-1990. Ed. Thomas J. Farrell and Paul Soukup. Atlanta: Scholars Press, 1995. 91-111. —. “Knowledge in Time.” Introduction to Knowledge and the Future of Man: An International Symposium. Ed. Walter J. Ong. New York: Holt, Rinehart, and Winston, 1968. 3-38. Rpt. in Faith and Contexts. Vol. 1. Selected Essays and Studies, 1952-1991. Ed. Thomas J. Farrell and Paul A. Soukup. Intro. Farrell. Atlanta: Scholars Press, 1992. 127-53. —. Language as Hermeneutic: A Primer on the Word and Digitization. Ts. Walter J. Ong Manuscript Collection. Pius XII Memorial Library, Saint Louis University. —. “Oralism to Online Thinking.” Explorations in Media Ecology 2.1 (2003): 43-4. —. The Presence of the Word: Some Prolegomena of Religious History. The Terry Lectures. New Haven: Yale UP, 1967. —. Ramus, Method, and the Decay of Dialogue: From the Art of Discourse to the Art of Reason. Cambridge: Harvard UP, 1958. —. “Secondary Orality and Secondary Visualism.” Ts. Walter J. Ong Manuscript Collection. Pius XII Memorial Library, Saint Louis University. —. “Secular Knowledge, Revealed Religion, and History.” Religious Education 52.5 (1957): 341-49; Rpt as “Secular Knowledge and Revealed Religion” in American Catholic Crossroads: Religious-Secular Encounters in the Modern World. New York: The Macmillian Company, 1959. 74-95. —. “Text as Interpretation: Mark and After.” Oral Tradition in Literature: Interpretation in Context. Ed. John Miles Foley. Columbia: U of Missouri P, 1986. 147-69. Rpt. in Faith and Contexts. Vol. 2. Supplementary Studies. Ed. Thomas J. Farrell and Paul A. Soukup. Atlanta: Scholars Press, 1992. 191-210. But not only do the whole-language deconstructionists reject the concept of the absolute word—the logos—but they reject the very system of logical thinking that made Western civilization possible. They not only reject the Bible, they reject Aristotle’s A is A. Their new formula is A can be anything you want it to be, which can only be the basis of a pre-literate or non-literate culture in which subjectivism, emotion and superstition prevail as the means of knowing. That, of course, is simply a form of insanity—the inability not only to deal with objective reality but to recognize and admit that it exists. A mind so inclined is a mind that will lead its owner to destruction. Actually, I probably shouldn’t have bothered with the bolding. Everything other than the fact Ong wrote Orality and Literacy is wrong. Even the direct quote from the book, “Literacy can be restricted to special groups such as the clergy,” fails to represent the context of the quote. In this particular case, Ong was discussing the historical emergence of literacy in the West during the medieval period, when, in fact, literacy was largely restricted to special groups such as the clergy.